This entry was posted in Stephanie Kelton and tagged fiscal cliff. Bookmark the permalink. Very powerful presentation. Can she get in front of the right audiences? Maybe a Congressional budget hearing? 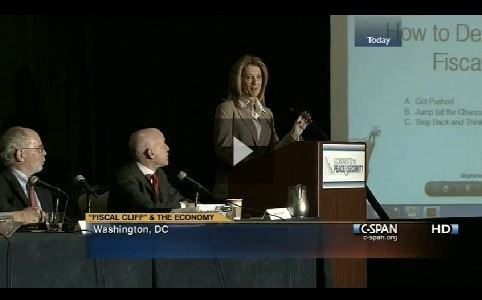 Yesterday my article was posted to OpEd News relating to the myth of the Fiscal Cliff. Today I received this post. This explanation is incredibly cogent and succinct, AND brilliant!! My article goes further, but isn’t as clear and concise. Yes, it is Kabuki theatre but the dopes can’t think straight. Somehow they imagine if they make more seniors live in poverty and take the knife to Medicare, all will be well. We live, after all, just like one big household so Grandma has to do her part so we can all live and keep away the creditors who are coming to foreclose on us. How sad is that scenario? Some form of Bowles-Simpson is baked in the cake. The only question is the ultimate trajectory (B-S will get what they desire in the end, but not what is desired out the gate) and immediate degree (back loaded deficit reduction is likely). The odd thing, however, is that deficits will actually rise, not fall under this plan, as it is self defeating in spades. Bread lines are coming. I suppose they’ll have to be implemented off budget if the government is to be involved.. What a travesty. How can we get Dr Kelton’s presentation into the WH? The barricade is bull headed thick. And even if we did, how does one get a congress intent on destroying us all to do a damn thing? Can Stephanie and Randy contact their local Senator, Todd Akin Claire McCaskill? I think its safe to say the WH know’s about MMT. Warren Mosler got them to pass the payroll tax cut. Its just not politically palatable for the president to come out and say this. Listen to the presidents own words, “We need to change Washington from the outside.” The way to do this is to change the media messaging from the bottom up. Start from local media and move to national media. Really? I had no idea he had such influence. Why is he not using it now? Great and a truly Gigantic service about the thinking of these United States and The American People and quality of Living! Thank you! Delighted to have viewed you on C-Span. Just fantastic presentation of what our American People are ‘really’ about. These United States being really not ‘revenue restrained’. In addition, ‘welfare reform’ is a form of money slavery and power playing. “Welfare To Work” are forced to work the jobs the social workers do not want to do nor or do not know how to do and even in some cases do not have the physical stamina to perform. So much so that wants are ‘really’ needs and your presentation is just what is shall we say, ‘bringing heaven to earth’. Statistics and facts is what I’d really like to apply with the “U.S.Gov. Is Not Revenue Restrained”? Perhaps details of what you talked about as “The Debt Service”! ? The cost to print $1,000,000 is approx. $1,000. The problem is the interest did not get printed in addition to the lending million. That is the ‘balancing financial structure’ America has at this time. No wonder there are bail-outs. The Allen Green Span and our “U.S. Gov. is not Revenue Restrained”! I’m throwing out an idea, I don’t know if it’s doable or how can be implemented in case it is..(I’m writing from Italy)….What about starting with TedTalks? How much does it cost to buy an 18 minutes spot for Stephanie? We could chip in to buy it and reach a much wider audience…. 1.) The foreign sector could be drawn more concretely. Who *are* these foreigners coming around to spread green stuff on our graph? Why are they doing it? Why do we let them? It isn’t obvious to very many people that the trade deficit is a real-terms benefit, so the presentation may be misinterpreted as meaning that China adds to our deficit “problem”. 2.) The mirror-image graph is powerful and effective, but the commentary should acknowledge the difference between households and firms. The blue regions include both the vampire squid and its quarry – an important distinction. 3.) Wall Street is not coming to shred the safety net and confiscate our pensions because they misunderstand the system. They are coming for us because they understand it well enough. A little more class-warfare talk would make it clearer where all these misunderstandings come from and who they are designed to benefit. Still – a very, very good and convincing talk. Thanks again, Professor! Point 3 is EXACTLY right – but I think they are afraid that if they appear too radical politically the economic argument will be ignored. I´m not sure, however, if the divorce is frasible. It would have been nice to see the presentation. Alas, it is now (15-Nov 09:45h EST) unavailable on C-SPAN. That is exactly where I landed the first time. No video, unless I click on the “Purchase” tab. I guess I didn’t realize one must purchase the presentation in order to see it. If Greenspan knew it was about real resourses ( of course he did ) – then why did he decide to run down the worlds capital base ? MMT will not deal with the core issue. There was a global free banking crisis with CBs at the center of it. And yet they continue to want this post 1914 symbiotic state. There is nothing symbiotic about it. It is a parasitic relationship. People may ask why did the banks invest in bad capital extractive assets ? Because the assets themselves be it fiscal debt or mortgages have no value , they never did. What has value is the legal right to extract a rent from goverment fiat. This can clearly be seem in this video…. The chief exec. Bank of Ireland (not the Irish CB) was recently grilled in a Parliamentary Committee. He repeated that it was all about the CASH FLOW of the customers and not the value of the present assets and he was right in the present context of banking units of account mixed up with goverments units of money account. This divine right of the King has been replaced by the banks divine right to speak gobbledygook to the masses……the entire 1648 thingy has turned in on itself. They (the connected banks) are messing up the FIAT money supply to preserve their credit Kingdoms and have been doing this on a formal basis in Northern Europe since 1648. But you have merely replaced one divine right for another…..ultimate power corrupts don’t you know. The banks can create infinite credit that cannot be paid off as there is no King to counter the banks and produce Greenback like currency where the note is as good as the bond. Bruce Bartlett barely spoke after Stephanie’s presentation. He is obsessed with raising taxes and thinks the federal government needs more revenue. If only he understood that he is effectively saying the federal government needs to destroy more of the American people’s money. I was surprised to see this on C-Span. I have been e-mailing Washington Journal trying to get them to invite Stephanie Kelton or Warren Mosler on that show for weeks. Perhaps others could e-mail them with a similar request. They have the Chicken Littles on every morning talking about the “Fiscal Cliff” and they just fight over ways to impose austerity. I would love to see Stephanie on that show where people call in their questions. She could educate them for sure. I hear a lot about the “tax revenues do not fund spending” thing with MMT. From an operational perspective, the Treasury does have an account with the Fed though that contains all the revenues, does it not? When spending is higher than the amount of revenue in the account, the Treasury must issue debt. I understand that we are not constrained by revenues, but we do use this money for our spending, correct? What the treasury does not receive in revenues it issues in bonds. Primary dealers create a market for the treasury debt as required by law. The Fed can then purchase the bonds from the primary dealers, however, there is a consistent demand for liquid; interest bearing securities; independent of the Federal Reserve’s purchases. MMT consolidates the balance sheets of the Fed and Treasury to make the process easier to understand. Ah okay, thanks for the clarification. Sorry about the double post on the next entry, wasn’t sure if anyone would be reading this far down to respond..
It’s great to see another MMT-oriented presentation by Stephanie, who presents a lot of impressive information and arguments in less than 20 minutes. Well done, and very encouraging! The general suggestion is to mobilize and focus the energy and expertise of MMT supporters to support further development of an MMT public communication strategy. 1. Create a volunteer working group focused specifically on helping to strengthen the effectiveness and reach of an MMT public communication strategy. This might include multiple subgroups focused on more specific areas: e.g., overall communication/outreach strategies; written content development and editing; audio and video content development and editing; graphics development; alliance building, etc. 2. Set up an ongoing NEP discussion thread focused specifically on public communication strategies, and have a link to it posted in a reasonably prominent place on the home page. This would allow a discussion of this subject to continue in one or more dedicated discussion threads, where all the ideas and exchanges related to it could be posted, tracked and referred to, without having to sift through old threads focused mainly on other topics. 3) Develop alliances and co-messaging strategies with progressive issue advocates. One benefit of this is that linking MMT directly to urgent and high profile policy issues (not just the “deficit” debate) will help clarify and strengthen MMT’s real-world relevance and significance, especially in the eyes of progressives whose policy arguments face an unnecessarily uphill battle in today’s deficit-obsessed policy debates. b) get MMT experts invited to appear as guests on MSNBC shows hosted by Rachel Maddow, Chris Hayes, Lawrence O’Donnell, Ed Shultz, etc. In a recent comment, Dale Pierce noted that Chris Hayes may be a good initial candidate for this; similar efforts might focus on NPR and/or other MSM outlets. 5) Solicitation and integration of community-member feedback on MMT content development, along the lines of what Joe Firestone did recently for his “MMT fiscal responsibility narrative.” As I recall, Joe solicited feedback not only from NEP readers, but also readers of his blog posts at other sites, including Daily Kos, Correntewire, FireDogLake and ourfuture.org. 6) Development of very short and simple language (e.g., billboard-length, as Charles Yaker suggests) that can be used as effective “MMT conversation starters,” along with attention-grabbing terminology, such as the “deficit owl” moniker, which I really like. (A question we might consider is “how would Frank Luntz describe MMT, if he was on our side?”) I like the idea of holding a “contest” in which people can offer up these kind of short MMT intros and labels, with the rest of us voting on and ranking our favorites. This effort could run parallel to development of longer-form content, ranging from the kind of paragraph-length points contained in Joe’s “MMT fiscal responsibility narrative,” to more in-depth material, a good amount of which is already available at NEP and other online locations. Taken together, this could provide a linkable hierarchy of content to help newcomers and early students of MMT move comfortably along the MMT learning curve, and in a way that fit their particular interests. 7) Efforts to mobilize MMT supporters in various online communities (e.g., NEP, Naked Capitalism, dkos, FDL, etc.) in support of MMT public communication efforts, such as those listed here (e.g., getting MMT experts invited as guests on MSNBC shows). Though I don’t know how many MMT supporters are in these other online communities, some of them (e.g., DailyKos) are quite large and may have capabilities that could be quite helpful. These efforts would be strengthened, if coordinated with #3 above: development of strategic alliances with organizations and online communities focused on progressive policy solutions. 8) Use (and, as needed, customize) existing online software tools and platforms to support the above efforts. As noted in #7 above, some of these might be readily accessible through alliances with online communities such as Daily Kos, FDL, Naked Capitalism, etc. I saw Simpson and Bowles today on CNBC. Bowles claims the Democrat votes are there for passage of Simpson- Bowles, and he mentioned sharp entitlement cuts were part of the package that has Democratic support. It was nauseating to watch. What the hell is wrong with the left? It’s really lost its soul. So if they’ve lost their soul… How does one get the soul back? This morning I was driving around in Northern Virginia, not far from DC. When I turned on my car radio and tuned it to NPR, I was very pleased to here Stephanie’s presentation, from near the beginning being broadcast to the DC metro area. I’d attended the meeting at the Capitol Hyatt on Tuesday, and also seen the presentation on C-SPAN, but, I was still excited to suddenly hear it coming out of my car radio on a sunny Saturday morning. There are a lot of bright people here. And they’ve been hearing wall-to-wall Peterson. For them to hear something entirely different getting through the MSM screens, is exciting. Especially since that something different is vintage MMT! Joe…did you happen to catch what NRP program it was broadcast on, or what the context was? Great to hear about this! No. I. Didn’t. But, it should be easily googled. All NPR did was rebroadcast C-SPAN’s coverage. So does NPR have like a follow up of the presentation? We need exponential numbers of thinking teachers/professors like her. Wonderful, clarifying information. Thank you.